The prime minister spoke like a leader with a large heart, sharing the plight of the marginalised classes across the world. He transcended his Indian nationality in doing so when he counted the people without basic amenities in billions, and urged all nations, especially the developed economies, to fight deprivation together. Quite expectedly, Prime Minister of India Narendra Damodardas Modi held the well-attended house of United Nations General Assembly captive to his world vision this early New York morning when the attendance has otherwise been historically low. Beginning his speech with invocation of the Indian/Hindu philosophy of vasudhaiva kutumbakam (the world is one family), he soon moved on to mentions of developing societies as well as troubled spots around the globe. And for every problem, he urged the UN to come up with a concerted effort of solution-finding. The appeal for humanitarianism and unity as a solution to the problems of the humankind marked the arrival of Statesman Modi on the world stage. Speaking further on philosophy, when Modi stressed living in harmony with nature, it was perhaps indicative of the new paradigm of progress that his government wants to set in India: Eco-centric development. It was, in all likelihood, akin to telling the world that our eagerness to grow did not mean we would wantonly trample over environmental concerns as the West did once, which it is now making up for. That is to say that the investments that would come to India must be for such industries that do not hurt Mother Earth, but sustain the flora and fauna, the water bodies and a clear, blue sky. To facilitate that, Modi said later in his speech, the developed economies should readily arrange for funds and transfer of requisite technology. Pakistan received no more attention than (a) a snub for bringing the bilateral issue of Jammu & Kashmir to the international forum (which he doubted served any purpose) and (b) the humanitarian offer of help that India had extended to it during the recent floods in the region. It was up to Pakistan to create the right atmosphere and come forward for bilateral talks to address the outstanding issues between the two countries, Modi said. Implicit in this speech was a message for our western neighbour: This is no place to crib; behave like a member of the global family, not like a frustrated member of a section thereof. Having told the world how important India considered its immediate neighbourhood that it began building closer ties with member nations of the South Asian Association for Regional Cooperation (SAARC) right after the formation of the new government, Modi expanded his focus to the global arena. He urged the UN to expedite the proposed Comprehensive Convention against Terrorism. Indeed, the scourge of seeking political settlements through violence that resurfaces again and again in new forms and with new names, as he rightly pointed out, warrants a non-negotiable policy of the international community that would make even germination of terror outfits difficult on the soil of any country. Why then doesn’t India commit its Army to, say, a crackdown of the Islamic State of Syria and Iraq led by the US, an American might ask. Tacit in the message of keeping the UNPKF on the forefront was India’s displeasure about the United States and its allies superseding the UN in military interventions across the world where American interests are hurt. It was to tell the Americans we wouldn’t be part of their plans; we would only be part of moves ratified by the United Nations. “The countries that contribute to UN peace keeping with their forces must be included in the UN’s decision-making processes,” our premier said. Taking the supreme international body to task for not making its 193 member nation-states work together to solve various crises, he questioned why separate sections of the globe should witness groupings like G-4, G-7, G-20 etc or any other group. “These numbers keep changing,” he said, adding even India was compelled to be part of such factions, in a clear reference to our membership of G-20. He exhorted the UN to work as “G-All”. 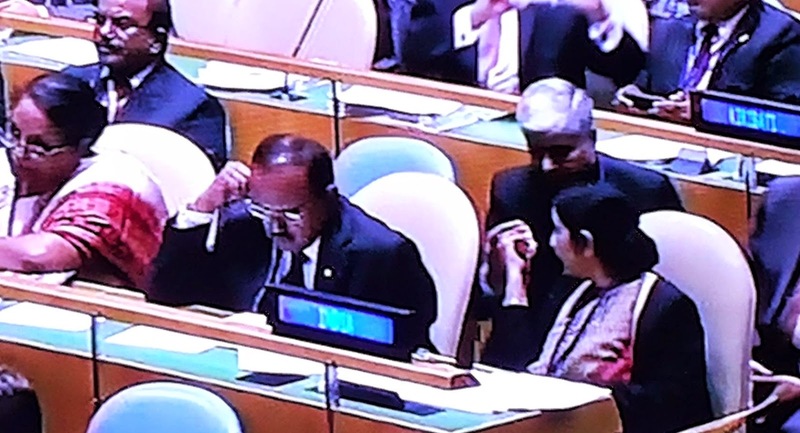 External Affairs Minister Sushma Swaraj and National Security Adviser Ajit Doval among the audience at the General Assembly. He certainly did not forget to reiterate India’s longstanding demand of expanding the UN Security Council. The transformation must happen by 2015, he demanded. Established in 1945, the UN will turn 70 next year. He asked the world leaders whether they would like to drag on with the old structure till the international organisation turned 80. Along the lines of the NDA Government’s work in the last four months since it assumed office, the Indian premier highlighted the pitiable status of sanitation, electricity and potable drinking water not being accessible for billions of people: 2.5 billion, 1.3 billion and 1.1 billion people respectively. In this context too, he said, all nations must join hands to bring about better basic amenities to the poor. Without mentioning India’s standoff with developed countries in talks under the aegis of the World Trade Organisation, Modi laid emphasis on accommodating each other’s concerns in agreements on international trade. The emphasis on nature and the roadmap of yoga appeared inspired by Swami Vivekananda’s address to the Parliament of World’s Religions more than a century ago, where the ascetic had explained to the clerics of different faiths how Hinduism was not a religion but a way of life everybody could follow. 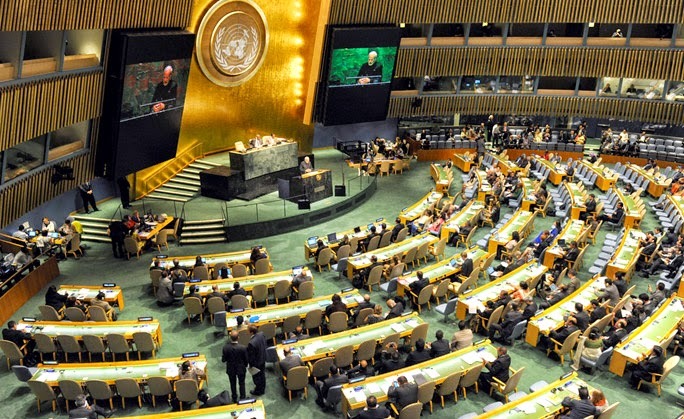 Modi’s appreciation of technology and modern means of communication that India is now well acquainted with manifested at the General Assembly as well. He ideated that the world needed to communicate more using the cyberspace in general and the social media in particular, aided increasingly these days by smartphones. He mentioned his recent proposal of building a free satellite for SAARC nations in this regard. The prime minister underscored the need to engage the youth and universities in international dialogues. He said there was a pressing need for nations to sit together and deliberate upon the mission the UN was set up for, how far it has travelled and in what direction it wishes to head. A lot has been said about the fact that Modi would choose to speak in Hindi, which he expectedly did. But so had Atal Bihari Vajpayee during his tenure as the country’s prime minister. The novelty that Modi brought to the oratory on the world stage was more refreshing. Slamming the attitudes of cynicism and retirement to fate of disunity, he used a casual phrase we Indians are way too used to hearing: “Chhodo yaar, ab kuchh hone waala nahin hai” (Forget it, nothing will come of anything). This correspondent is not sure whether any other world leader has ever invoked the equivalent of Hindi colloquialism “yaar” in a speech addressed to the General Assembly. It is, of course, to be seen how pally with India that turns the world powers into. The good attendance mentioned in the introduction raises a lot of hope. Representatives of the world are clearly eager to do business with Modi-led India. This article was sent for publishing to a web portal right after the end of the prime minister's address. Since the headline its editor chose for the write-up failed to uphold the central theme of the speech, it is being reproduced here with the original headline. I highly appreciate your commentary on Modi ji provided statesmanship to India. He is pragmatic, honest to the core, and means what he says. Good governance does not come from somewhere else. It is within. The 'tone at the top' is vital for entire machinery of governance including its diplomacy, and foreign relations. If someone can generate trust among its stakeholders, we can doubtlessly declare him/her as the visionary statesman and Indian PM is getting success on this front. Trust generation is a time consuming process and the results will be visible in the course of time. Modi ji is on the right track. I wish him best from Canada. I will suggest you to reflect on his every action and the results and bring these out to the notice of larger public through your commentaries, reporting, and views.